HMS York in Grand Harbour. 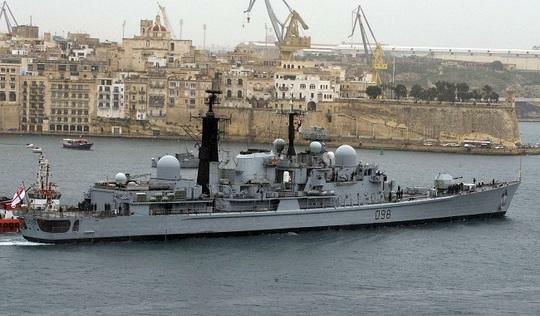 The Royal Navy frigate HMS York has arrived in Benghazi and is unloading tons of medical supplies and other humanitarian aid donated by the Swedish government. The medical supplies, a donation to the Benghazi Medical Centre, were supposed to have been flown direct to Benghazi airport but when the airport was closed down, they were diverted to Malta. They were transferred from the airport to the frigate at short notice by the Armed Forces of Malta. "This speed of reaction permitted York to sail and reach Benghazi more quickly with the much needed supplies," the British High Commission said. The supplies include needles, syringes, surgical gloves and bandages. The frigate will return to Malta with evacuated workers. The Commanding Officer, Commander Simon Staley said: "There has been a real international flavour to this mission, with the Maltese Armed Forces transporting the Swedish medical supplies so the UK could deliver them to Libyans in need". Meanwhile, the Virtu Ferries catamarans, which have made a number of chartered evacuation trips between Malta and Tripoli, have now widened their reach, also covering Misurata and Sirte. A South Korean ship also arrived in Grand Harbour this morning, bringing 300 workers.